Disclaimer: The information contained herein is based on data considered accurate. However, no warranty is expressed or implied regarding the accuracy of these data or the results to be obtained from the use thereof. Vendor assumes no responsibility for injury to vendee or third persons proximately caused by the material if reasonable safety procedures are not adhered to as stipulated in the data sheet. Additionally, vendor assumes no responsibility for injury to vendee or third persons proximately caused by abnormal use of the material even if reasonable safety procedures are followed. Furthermore, vendee assumes the risk in his use of the material. 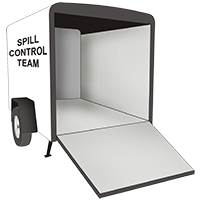 Disclaimer: The spill trailer customizer is a tool to help calculate the resources needed based on specific variables. It is not an exact science, so this is a general calculation only.